For being the first week in February you couldn’t ask for a more beautiful day to take a hike in the woods and do a little casual birding. The sun was rising on a cloudless blue sky with temperatures already above freezing, with highs today to reach in the lower 40’s. Reminiscent of early Spring, than a month and a half left of Winter. A friend of mine showed me a picture of the Crocuses that are ready to bloom. Oh well another Winter without snow. Today I was off to Long Branch Farm about 7 miles from my house. Donated to the Cincinnati Nature Center in 1973 by Neil McElroy (former CEO of Proctor and Gamble and Secretary of Defense) this 642 acre park has 4 miles of hiking trails, ponds, streams, deciduous forests and fields. Most of the birds seen today were your typical ones you’d expect to find in an area like this. 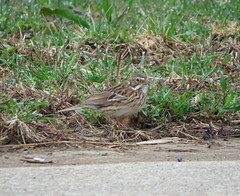 Song Sparrows were abundant as I wound my way through mowed paths with thick thorny thickets lining both sides. The trail ran on, then into the woods it went. With temperatures still cool enough overnight, the trails were still frozen with good footing, which helps keep the old boots from being too muddy. Carolina Chickadees, Tufted Titmouse, Red-bellied Woodpeckers were everywhere. Occasionally high in the tree tops you’d spy some Golden-crowned Kinglets, but nothing spectacular. Which was fine with me. Until…something small and dark darted across the path right in front of me. With something this size and coloration I immediately thought Winter Wren. As typical behavior with Winter Wrens they like to stay hidden in the undergrowth, that’s until I was able to “pish” the bird into the open. 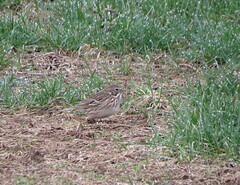 For me this was a great bird, considering how elusive they can be. They’re always around if the habitat is right, it’s just being at the right place at the right time. As I was walking out of the woods I came upon a gravel road with some agricultural fields running adjacent to the road. I caught sight of these 2 Red-tailed Hawks and thought we have a juvenile and a adult just by the clean, lack of distinct streaks on the breast. I can’t wait till Spring, this place should be hopping with birds. Well it’s finally over, and I have some good news and some bad. The good news I saw more birds this January than I have for the last 2 years. The bad news is that I never reached 100 species, which honestly doesn’t surprise me. Weather wise it’s been one of the wettest January that I can remember. 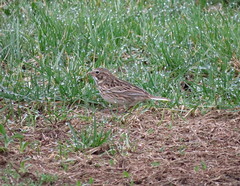 Normally a little rain won’t keep me from birding, but after a while you have to say enough is enough. I got out a much as I could except for the weekend I visited my daughter in Michigan. It was a lost weekend for birding but I’ll trade any birding trip for any time I can spent it with my daughter. All told I spotted 83 birds with Turkey Vulture as the last bird for the month. Next year I’ll be retired and I do expect a better performance with the added free time during the week. I may not hit 100 species but sometimes it’s not just about reaching a goal, it’s being out in nature enjoying what I love to do. I may chase a few more birds further away from home, I’m just not going to be mental about it. Time to relax and enjoy what brought me into birding in the first place. I have this “Go-To” spot for Horned Larks during my January Challenge, and it didn’t disappoint this year.